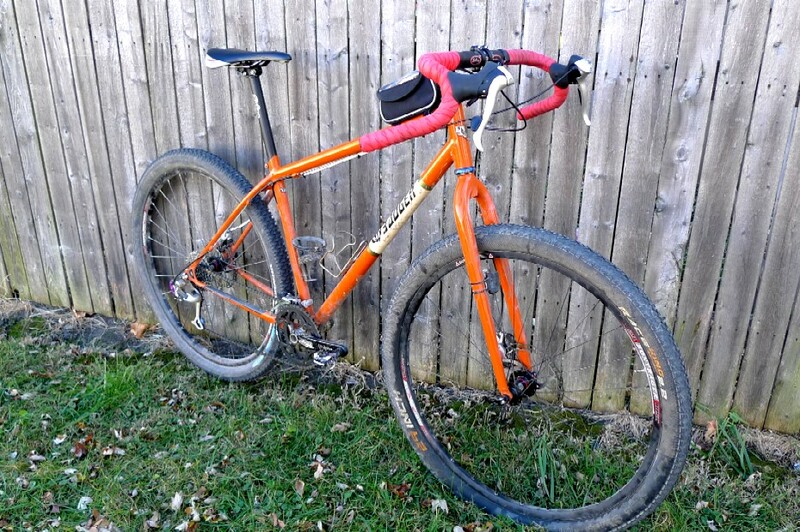 When the subject of this concept for a gravel grinder specific rig came up, I got a few comments about some other bikes that would be good for the job, and wouldn't require a "clean sheet of paper" approach. On one hand that is a very good way to go about this situation. I mean, why bother with all the bother if you can just get by with something already being produced and save money in the process? It makes sense, and it deserves to be discussed. Finally, to be perfectly honest, I looked long and hard at both of the following bikes and nearly pulled the trigger on both. Still might do that for one of them. 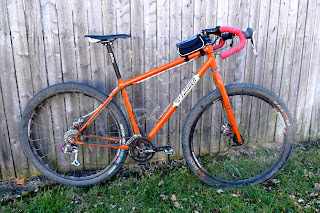 Salsa Cycles Casseroll (Version II): Here is a classy bike and it has been recently overhauled with some details that brought it close to being my choice. What's Good: First of all, Salsa went with cantilever brakes, which make this an immediate contender. They added the front rack, which isn't necessary, but it is an interesting addition that I could make useful. The fact that it looks smashing doesn't hurt either. Cost could easily be contained by going with the frame set option, and using some old Campy stuff I already own.Finally, it has a relaxed, low-ish geometry. So Why Not? Basically it boils down to the geometry and an unknown in tire clearance. 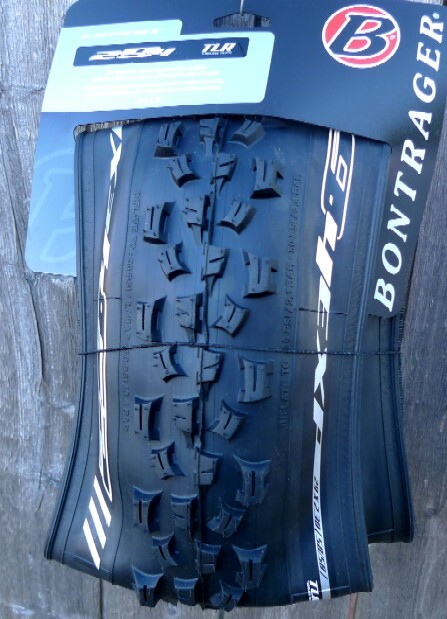 I am pretty sure it falls shy of my 42mm ideal tire size, (web site states it can take 38's with fenders), so that isn't ideal for me. The geometry, while backed off from criterium steepness, isn't quite where I would like it either. Still a definite "maybe" here. 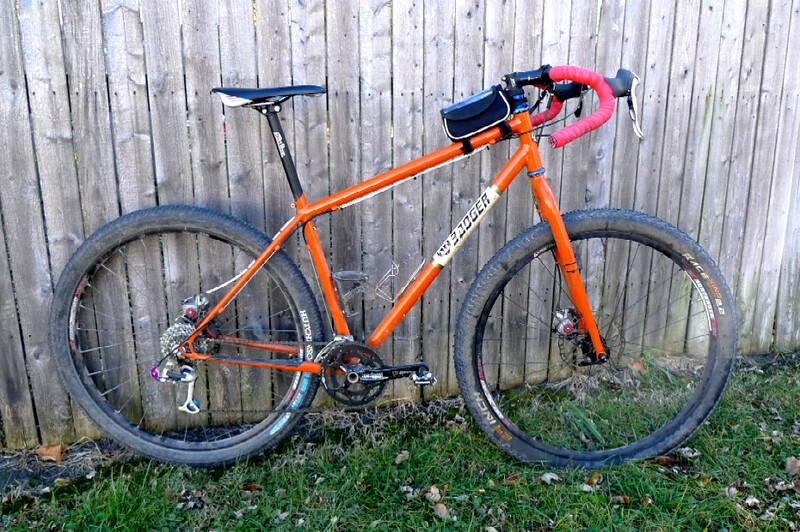 Surly Bikes Cross-Check: How many gravel grinders have at least one Cross-Check in their pelotons? I bet most if not all. What's Good: The Cross-Check has some features that are spot on. Slacker head tube angle, big tire clearance. 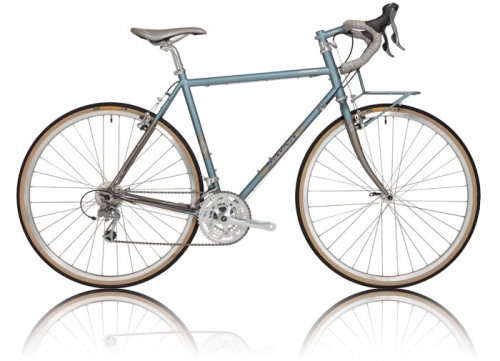 The new Robin's Egg Blue is stunning, and the frame is as reliable as tomorrow's sunrise. As with the Casseroll above, the Cross-Check supports a single speed option. Again, a frame only option leaves me with a cheaper alternative than going custom. So Why Not? Again, the geometry isn't quite where I would like to see it. Another thing that I see as a strike against this frame is the heavier tubing used throughout. 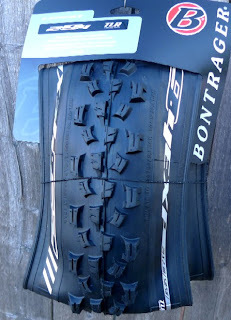 However; the tire clearance is enormous on the Cross-Check, and there is no denying its gravel grinding pedigree. Again, a definite "maybe". A Note On Geometry: You'll notice I am being a stickler on the geometry deal. Why? Well, for two years running I have almost bitten the dust because the geometry of the bike I was riding down a really fast, loose descent caused handling issues I would rather not experience. 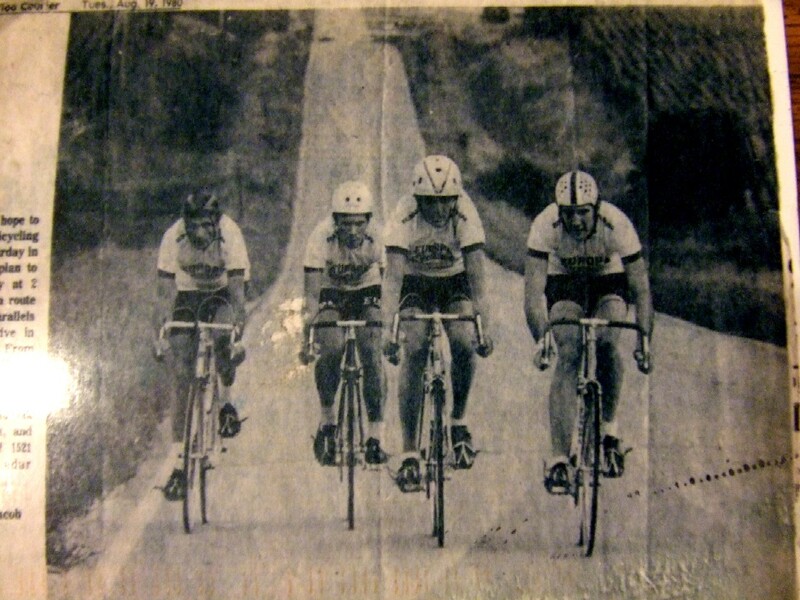 I also have noted that over longer periods in the saddle, I like a more stable, "in the bike" feeling, and I can't find that in many of today's offerings. 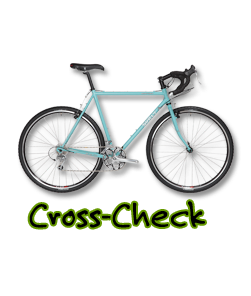 The Cross-Check and the Casseroll both have elements of their design that I find attractive. If I could have an offspring of the two, I would probably go with that, but obviously, that isn't going to happen. 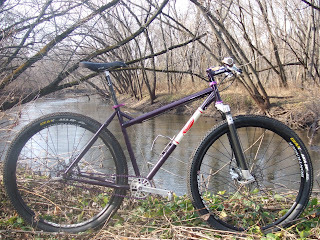 So, I am exploring a custom bike that addresses my concerns and isn't a mountain bike. That was my mistake before: I insisted on single track-ability. Not so with this bike. I'm going for a pure gravel rig here. Saturday was all about the Turkey Burn ride at Camp Ingawanis' South Side. I got up late and moseyed on out there by about 9:30am, I suppose it was. There were three guys setting to go out, and they turned to wait for me, but I waved them on. It was cold and I didn't want them to catch a chill waiting for me to fumble through my stuff. I saw Captain Bob's bike and another Orbea sitting there, but I didn't know where those two might be. I took off and rode a loop on my own. One thing that was quite apparent was that it was so cold the ground was frozen and that traction was endless. Basically, this is our version of "hero dirt". There was no way you could go too fast to break your tires loose. Well, not the AKA Geax tires I was running anyway! After running one lap, I got back where the three fellows ahead of me were just taking off their helmets and heading inside the big RV that was parked out there. Inside was Captain Bob, not feeling too well. He had a nasty cold or some other malady. He had done a bit of riding and settled in the RV for the duration. We all chatted each other up for awhile, but then the party broke up. I went out for another lap before leaving. On this one, I scared up the big deer herd in the Camp and deer were scurrying all around me, and across the trail in front of me. In fact, it got a bit spooky after I noticed one big doe that walked alongside the trail not more than a few feet from me. 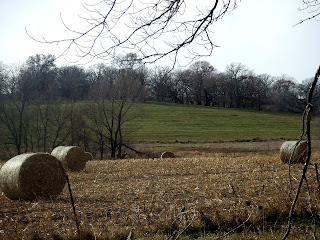 I decided to stop and let the deer settle down and clear out while I snapped a few images. Then, I took off to find an empty parking lot, just like it usually is when I ride out there. A magical day for a ride. Then Sunday came and it was a whole different scene. I had a different bike with a new fork on it and with new tires on it as well. The fork was a shorter axle to crown affair and I had never ridden the Big Mama with a 100mm fork. Recipe for disaster? Well, consider the fact that the temperatures "soared" into the 40's, melting the top layer of "perma-frost" and the answer is "yes". Yes it was a recipe for disaster. I have to explain the terrain I rode on. "Grease" is the name for the condition of the dirt I am talking about. Silty river fluff that is mostly black dirt and sand mixed together which holds plenty of moisture. Generally at this time of year it freezes, which is a fast, fun condition to ride on. When the sun hits bare earth and the temps get around freezing or above, then that top layer un-freezes and turns into this "grease". It might be a bit hard to understand yet, so let me offer this example: Let's say you have a tiled floor. Now imagine you have an inch of axle grease on that and some sand and leaves over this enough to camouflage the grease. Now imagine riding a pretty smooth two inch to three inch wide tire on that. Yeah.......it's not going to be pretty! 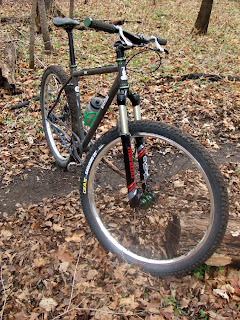 Fortunately I had on the new tires: Bontrager 29-4's, which are really aggressively knobbed affairs. Still, these were barely enough to keep you upright, and to be honest, a couple of times they didn't. But really, in a few of my spills, no tire would have helped. It was just that slick. I did manage to ride out a few slides and one was a true crossed up affair at speed through a corner. WooHoo! <=="I'll get you next time, you filthy, greasy trail! Grrr!" The best biff was the last of the day. Trail goes down into a shallow ravine, then hard right at the incline out. The tires gave way, and I got dumped off on the right side, falling on my right knee and right hand in the sticky black dirt. I actually slid forward to a stop about a foot, and then as I sat motionless, I actually slid backwards back down the slight decline a few inches. That tells you how slippery it was! If dirt could mimic slippery snow, this is it. The funniest thing about the dirt when it gets like this is that it doesn't really stick to anything else but your tires. My frame showed no signs of this muck after I got home, and even my thermal tights were barely showing any effects of the greasy dirt on my knee after I got home. It is the strangest stuff. All in all it was a great weekend. One day I couldn't fall down if I tried, and I pushed it hard. 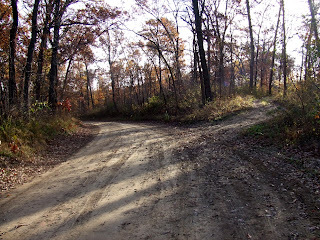 The next day I was tippy-toeing around the single track and I fell to the earth four times. Hero to zero. Keeps me honest, it does! <===Scene from the Turkey Burn ride. Report on that and more on Monday. 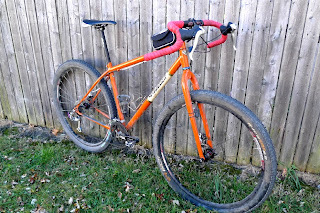 Continuing on with the thoughts on a gravel grinder specific bike from yesterday's post. I laid out the basic geometry of the bike as I see it, now I want to get into some things that are maybe a bit strange, and certainly specific to my wants and desires. Yep! Here is where we go off the beaten path. The Paul Racer Brake is a replica of the old Mafac Racer brake that was in use years ago. As you can see from the photo, it has loads of clearance and it is quite powerful. What we are considering is putting it under the chain stays. Why? We feel it will allow for an unencumbered seat stay which, since it won't have to resist braking forces, could perhaps be a bit more "flexible" and give a more comfortable ride over the long haul. Not to mention the fact that it will look sleek as all get out. Yes, there are some technical challenges to fitting all that under there and have the cable work it. This may not happen in the end, at which time we would default to cantilevers, or at least I would. (Or maybe we'd just put the racer brakes on the seat stays after all, who knows!) Anyway, it will be a fun exercise to see if we could possibly pull it all off. Time For A Concept Bike! Okay, I've ridden a lot of miles on gravel roads on a lot of bicycles and I have an idea. My idea for a bicycle specifically designed for gravel road riding, and...well.....that's about it! Yes, I could use it as a paved road bike, but that is a secondary consideration. The following are my ideas which are pretty set in my mind for this project. -Capacity for 42mm tires with a bit of room to spare. -Chain stay length can be long-ish, but this isn't a touring bike either. -Three water bottle mounts, pump peg, rear rack mounts. 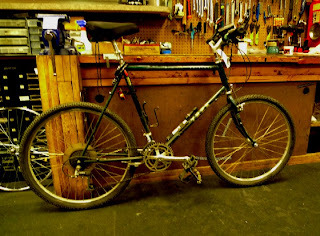 What this bike isn't going to be is a Rando bike, touring bike, or cyclo-cross bike. It isn't going to carry a load on the front. I may want to have a light load out back, thus the rack mounts, but again, it isn't ever going to have panniers. 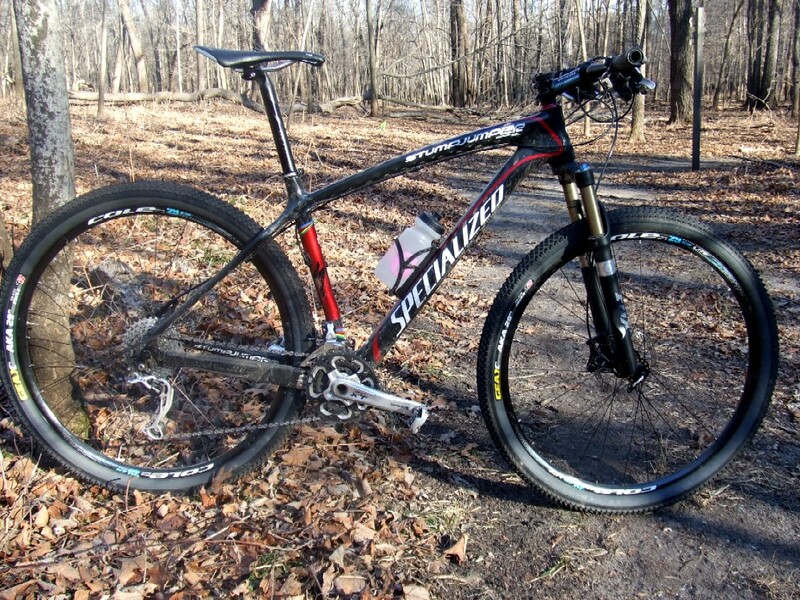 I'd probably run a 2X10, or some 2X set up with friction shifters likely. It is primarily going to be about being stable, easy to ride when tired, comfortable on long rides, and simple. 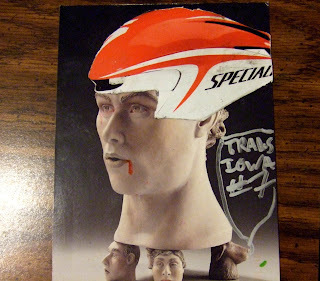 But first, if you care to read a truly fine bit of wisdom, and you are a Trans Iowa Rookie, go here. "Please emphasize that you are on your own along with the idea that having someone waiting in standby means somewhere else other than leap-frogging riders on the course. It's important to have your backup/bailout plan in place, but it should be exactly that, a rescue. Not some circling mother-hen-type person(s) meeting riders at various points along the route to make certain you are okay. To me, that sounds a little too much like support. 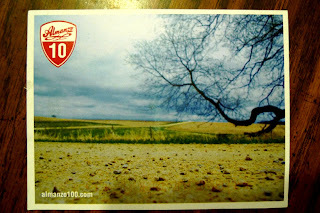 Enjoy the very lonely feeling and isolation out there, oh so very alone suffering on Iowa gravel"
Okay, so we don't want folks out on course, which means no spectating! No spectating means "no one following anyone around." Nobody. Got that? This also applies to checkpoints, which we are going to discourage anyone from going to, (the first one), and forbid anyone going to the second one, which is on a remote intersection of two Iowa rural roads. No parking- no place to sit, no amenities, no restrooms, well.....I think you get the picture. So, where should support people be? In their hotel, motel, or possibly another cool location. (I'll be making an announcement soon). Stay tuned on that front. We've got time to develop that idea yet. Wireless Support: Finally, another T.I. Vet suggested this topic: The temptation to "connect" via cell phone while you are riding, or take calls from folks outside the event while you are riding. Tell me what you think: Having a voice in your ear while you would otherwise be "alone" out there is something good, no? Something that gives you a "boost", right? Well, doesn't that sound like "outside support"? I think it is. While d.p. and I can not stop anyone from taking this sort of support, I would appeal to your honor as cyclists to not engage in any of that sort of thing. If you have to use a cell phone, let it be only to drop out of the event and call in for a ride. Basically, "Never Quit, Never Use You Cell Phone Unless You're Going To Quit". The only other reason for a call here is to get help in case of an emergency. Okay? Nuff said. Just a word on cell phones in Iowa: (Well, Rural Iowa! ): You may want to consider actually turning your phones off. Many a T.I. competitor has found themselves without a working cell phone due to the amount of roaming for signals your phones will be doing out in the digital hinterlands. 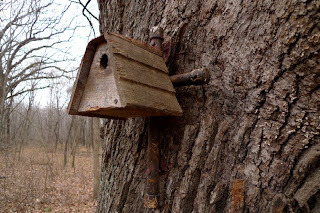 Yes- believe it or not, but cell phone coverage stinks in the country away from main highways in this state, no matter what Verizon, or Sprint, or what ever phone provider says. Just keep in mind that when you are in the vicinity of a paved road you'll generally get a signal, and valleys are cell phone death areas. Get on top of a hill if you have to call. Finally, the rural Iowa citizen is generally a good hearted soul. Knock on a door if you have to. Okay, that should about wrap it up on my "support series" on the T.I.V7 updates here. In perhaps an example of fortuitous timing, Bontrager sent along this belt from their "eco" line of products. Stuff that is recyclable and in some cases, like this, are recycled materials themselves. 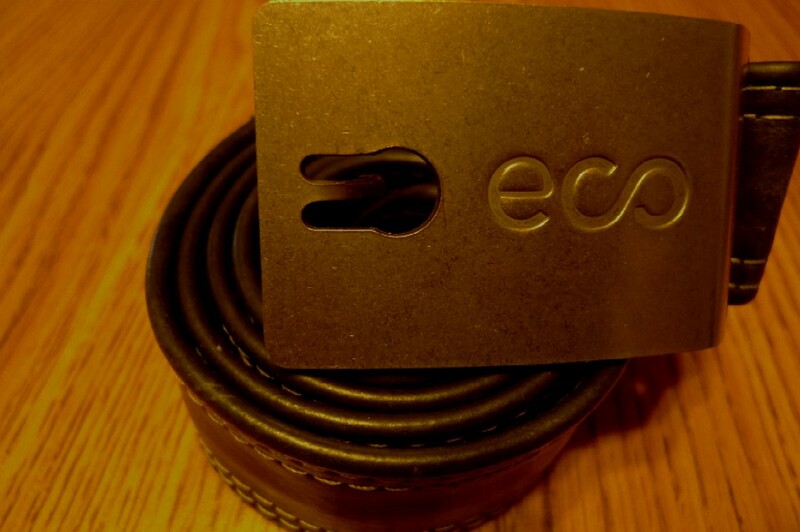 This belt is made from ISO 622 rubber inner tubes! A very appropos Thanksgiving gift, since it stretches, which is what my gut is going to do if I am not careful. At least I won't have to let my belt out a notch! It'll just stretch! ha ha! Okay, I hope all of you are having a great time with family and loved ones. Be safe and don't eat too much! Problem Solved: I was having some issues with braking on my Badger I just got back up and going again, and I solved the issue with this little doohickey called a Travel Agent. It works really well. The issue was that with STI levers, which are meant to pull less cable, but have a high mechanical advantage, the Avid BB-7 Mountain Disc Brakes were not functioning at an optimal level. They need lots of cable pull and a lever with less mechanical advantage. The Travel Agents upped the cable pull to the point where I now have awesome brakes on the Badger. You can read more about it by checking my mini-review on these gizmos over at The Cyclistsite.com. 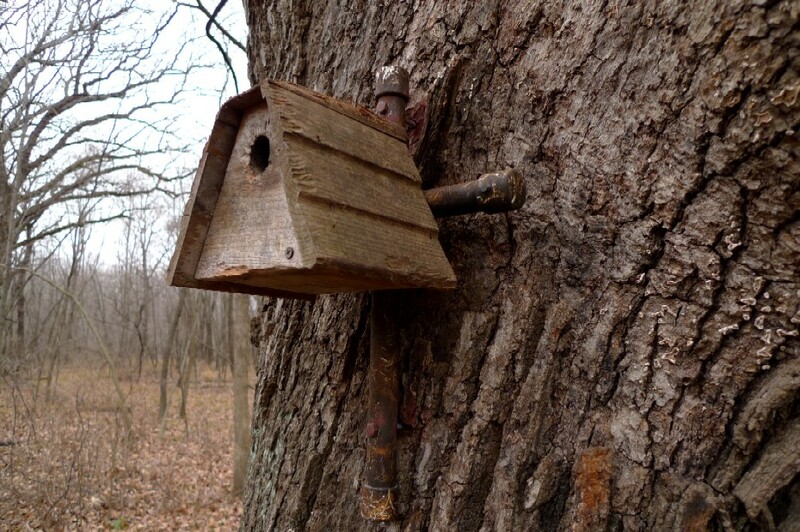 What's In My Stand: I had this old girl come through the other day. 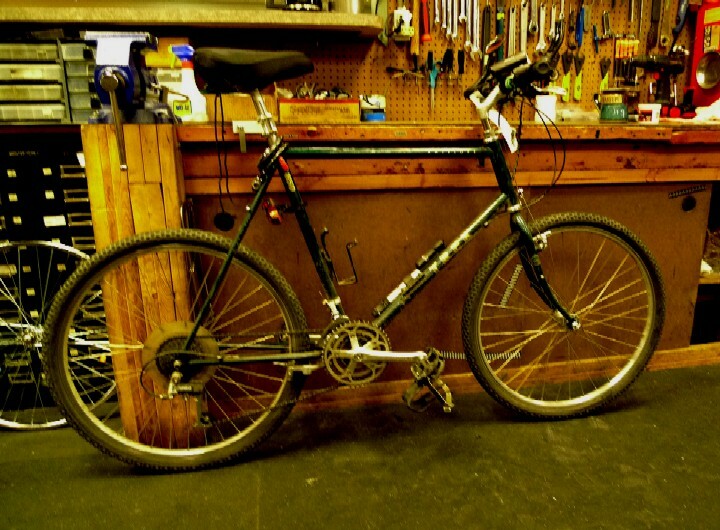 A Trek 850 Antelope model with under the chain stay roller cam brake. It is a throwback machine to the mid-80's when mountain bikes were still made to mimic the Norcal geometry which itself was borrowed from "pre-war" Schwinn cruiser bikes. This one is a "rider" so many of the original parts were gone, but the SunTour "XC" stem was still there and looking great. It's neat to see the old ones come through and it reminds you just how far things have come since the dawn of the modern mtb happened. Anyway, I'll have to pop these on a rig quick and maybe I'll roll these for the Turkey Burn on Saturday at The Camp. By the way, if you make it out there Saturday, Captain Bob says he's bringing chili, so make sure you work up an appetite! Bonus: Weather is now predicted to be a bit warmer than previously thought! WooHoo! As many of you loyal readers know, I committed to buying a Salsa Cycles Mukluk awhile ago. News is that the bikes are coming......soon to this area. (Already in Alaska) How soon will I get the call that mine is ready? Who knows? I'm okay with waiting though. Whenever that day comes, it will be great to finally have a flotation bike in the stable. "Flotation bike"?, you say? Isn't this a "snow bike"? No. It isn't, and here is why that is. You know, when you forget your rain coat, what does it do? Yep! It rains. Superstition? I don't think so. This is a de facto "Law of Life". Tell me you don't break down when you forget your tool kit at home. You know its true! So, in the same vein, it will not snow much at all this winter where I live. Why? Because I am buying a "snow bike". So since it isn't going to snow, I am calling the Mukluk a "flotation bike". All I know is that come snow, or no snow, this bike should be a lot of fun. The link to the events calendar will be right under the GGN header image and the current listing on the sidebar will get cleared out by the end of the year. The main reason for the new page is to allow a month by month listing of events, which wasn't possible to pull of with the front page of GGN. I'll continue to post "Race Discussions" for each upcoming month's events, but hopefully this new page will answer the requests I was getting for a "calendar" format for an events list. Turkey Burn: Well, I guess we're doing the Turkey Burn again this coming Saturday at the South side of The Camp. Temperatures are forecast to be pretty chilly, so dress warm! 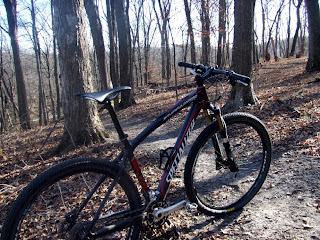 The trails are in great shape, and word is that the weather is supposed to be dry, so they should be great to ride on. Just waaaay cold! We're talking around 20 degrees when things get going around 8-8:30 am. Here's how you get there; Find yourself on HWY 218 and go to Janesville, IA. Turn east on County C-50 and go two miles east to a left on gravel at Hawthorne. Go north on Hawthorne 1 1/2 miles to the first left you can make. Take this about a quarter mile and the gate will be on your right side. See ya there! <===Ahhh! The soothing elixir of rural solitude went down good. I'm not going to hide the fact that the last few weeks have been pretty stressful and that reached a climax this past week. Some of it was due to trying to cram in all kinds of activities into the perceived end of good weather. Some of it was due to things going on in my personal life, and some of it was running Trans Iowa. Any of these wouldn't have been a big deal on their own, but the combined effect was wearing me down. I needed to decompress. There were lots of things going on I could have been a part of this past weekend too. 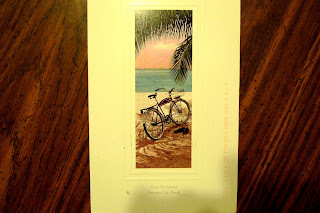 Cranksgiving, the TOBASCO ride, and probably something else I am forgetting. 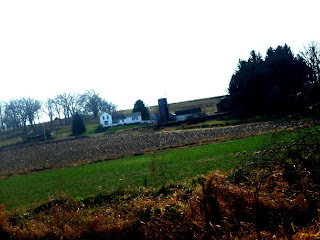 I passed on all of it to do some "Trans Iowa business", which was really, at the heart of it all, a ploy to just unplug for a short time and escape to a place of solitude. 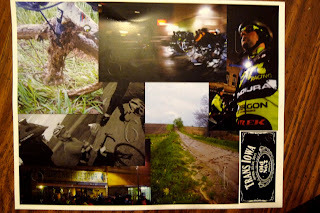 While the place I rode was on the upcoming T.I.V7 course, it wasn't really all about that. In fact, I didn't "need" to do this recon, I just wanted the excuse. I knew that this part of rural Iowa would be just the ticket for my over-crowded mind to get some relief. It did, but it almost didn't! Just a mile and a half into the ride, my tubeless tire decided it didn't want to be tubeless anymore. Tubeless tires will do that to you. Not a puncture, but when the sealant loses the capacity to maintain an air seal. The sealant was just old. Well, fortunately I had a spare tube, pump, and........tire lever! Ahhhh! I forgot to pack a tire lever! Maybe I wasn't going to get in this ride. I was not at all happy, I'll say that much! As curses were carried away on the East wind I settled down, and started to work the bead edge. Using some of the leftover slimy sealant to help, I finally managed to work over the bead by hand. Yes....it was quite difficult! Especially considering that I was working with a Bontrager TLR rim/rim strip and a Hutchinson tire. After I pulled the tire bead off, I sat and picked at the dried up, rubbery sealant. It was kind of therapeutic in that same way peeling sunburned skin off your arm is. (Well, I always got calmer when doing that!) Anyway, I finally finished the task, pumped up the tire, now with a tube inside it, and took off. I finished the ride feeling very peaceful and satisfied. It was fun, and even though my toes were freezing, it was just what I needed to do. Now I feel ready to pick the ball back up and run with it, except that this darned weather is actually going to the cold side now for this week! Trans Iowa V7 Update: Now What? <===Out of 100 postcards this was the only one with an Easter/Gravel theme. The Waiting List: Unless there are some post cards that arrive today, there will not be a Waiting List. 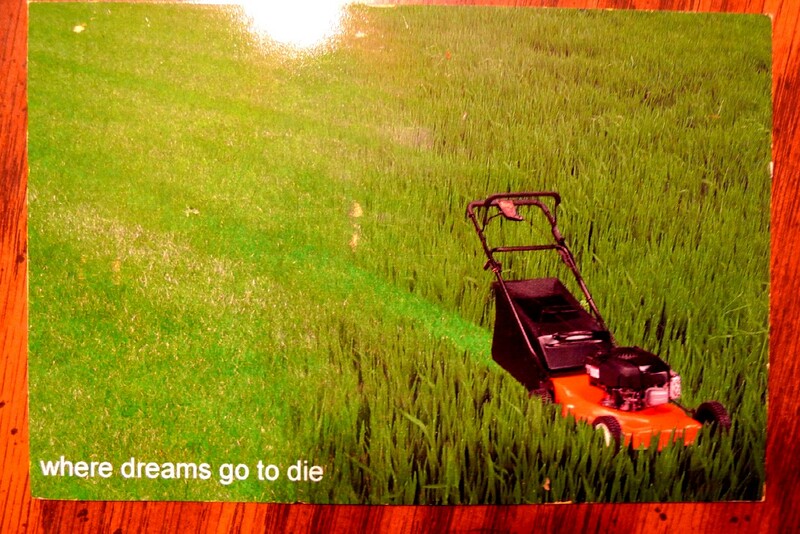 Tomorrow is the last day any post cards will be accepted. If someone, or two get on the list, in all likelihood they will get on the roster. (Last year I transferred in six folks) This Waiting List process works like this: If anyone for any reason on The Roster will not be in T.I.V7, they e-mail me ASAP upon making that decision and I will then contact #1 on the Waiting List. (Again.....if there is one!) If no waiting list is necessary, then I still will want to get the notification of the drops for other purposes, but that will not affect you racers still in the mix. It is quite possible that the roster will start shrinking sooner than later due to the nature of this year's registration. I will not add riders in a week, two weeks, or even next Tuesday if we do not have a Waiting List, so don't even ask. Okay, beyond the possible Waiting List action and the impending and inevitable roster shrinkage Trans Iowa news will be limited to the odd sponsor announcement, and rare mention for the next few months. I don't expect any big news, so essentially T.I.V7 will be going off the grid here until March most likely, when the whole deal will kick back into gear in preparation of the April 23rd start at 4am. Of course, all of you will be busy training. Hopefully the winter will be conducive to getting in the miles you need where ever you are at. So, for now it is time to move on to other things here on this channel unless I get some big news to share. Happy Training! UPDATE: We have reached our field limit of 100 with four post cards in today putting us exactly on the limit. A couple of things happened today that inspired this post. one was a conversation with a customer at the shop, and the other was the latest issue of IMBA News. Both things had to do with places to ride your mountain bike. 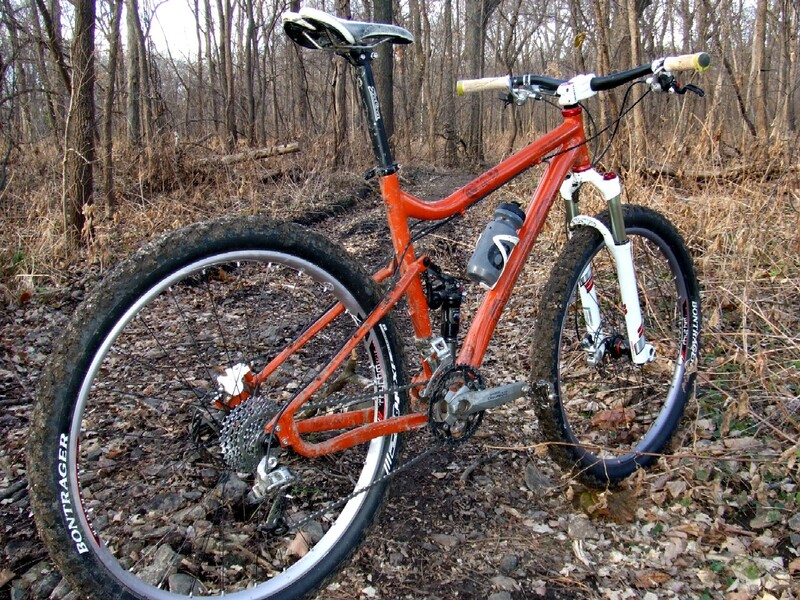 Rock Lake Cluster: Location: Cable, Wisconsin: Just named an IMBA "Epic Ride" this trail network, the excellent work of CAMBA, is a great ride. I've had the pleasure of riding it in the 90's and in this decade. Crazy, twisty, rocky trails and plenty to challenge any skill level here. 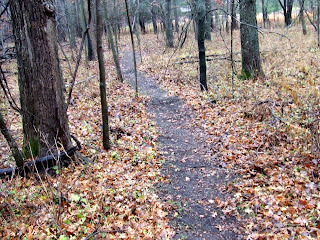 You really get a great taste of the "nort-woods" on these trails as they meander around lakes and through the pine trees. The trails are easy to find, and the maps are excellent. (Highly suggest getting one for a ride here) I don't know what took so long for this trail to get "epic" status from IMBA, but I do know it is very deserving of that moniker that is so cliche in mountain biking today. It really is epic! Well worth the drive. Lebanon Hills: Location, Apple Valley/Eagan, Minnesota, (Basically, the southern Twin Cities area): I've ridden here many times. Don't let the smallish parking lot and innocent look at the gate fool you. What's inside will blow your mind with its twisty-turny, rock laden goodness. Berms! 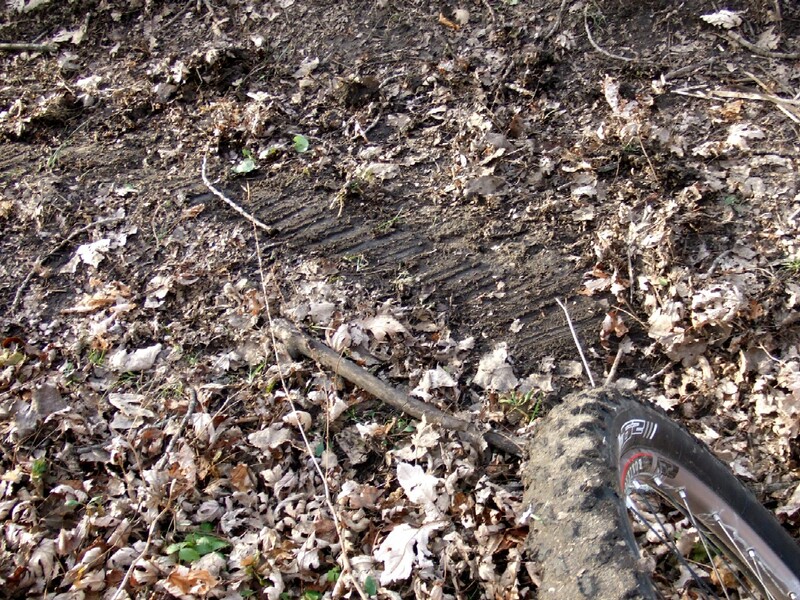 Yes, berms exist in the Mid-West folks, and they are fast and fun. 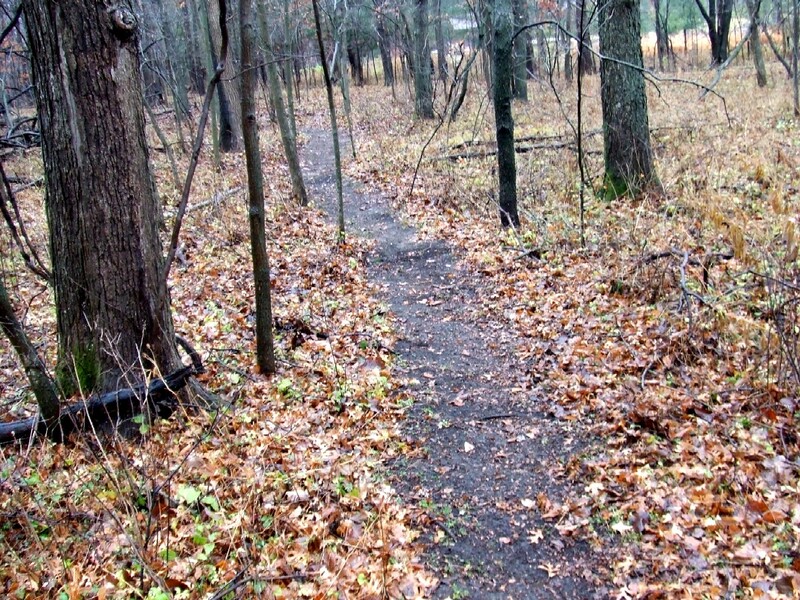 This trail system is laid out so that loops can be accessed from a centralized "meeting" place and are marked according to skill level. Laid out by the hard working folks of MORC, these trails will challenge your mountain biking skills and are not to be taken lightly. I would say that minus high altitude and long climbs, there isn't anything out West that "Leb" doesn't have to offer. The rock gardens are amazing and will blow your mind alone. Go ride there! 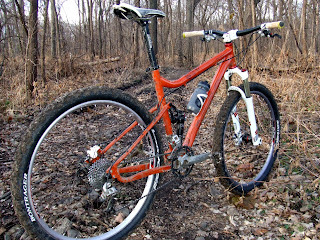 Murphy-Hanrehan Trail: Location, Savage, Minnesota area, (Again, southern Twin Cities): Another masterpiece carved out of the woodland prairie by MORC, "Murph"is an amazing trail system that features some of the best flowy trails I have ever ridden. This is an excellent spot to ride if you are a single speeder, by the way. Perhaps a bit less intense than "Leb", Murph is far enough away from the heart of the Twin Cities that you may find yourself alone with your thoughts during much of your ride, but you shouldn't be so selfish as to ride it alone! Best to bring up a tribe and have a single track ho-down here. Platte River State Park/Omaha Area: Location, Bellevue, Nebraska, and Louisville, Nebraska: This is more than one ride, but you could hit all these in a day, or better yet, two days. A weekend! Road trip! Ah....okay, I'll settle down now. You may be asking yourself, "Nebraska?" Yes- Nebraska! First off, Platte River State Park is an amazing trail system that has a bit of an "unpolished" feel but is well kept up. I like that about the place. The trails have great climbs, fun descents, and plenty of twists and turns mostly under the canopy of old hardwood trees. You do get a bit of a prairie exposure part way through as well. These trails are shared with equestrians, so mountain biking times are limited to very early mornings or after 4pm in the afternoons. Then you can hit up the awesome Omaha trails like Swanson Park and Jewell Park. I wrote up a piece on these trails you can read here. 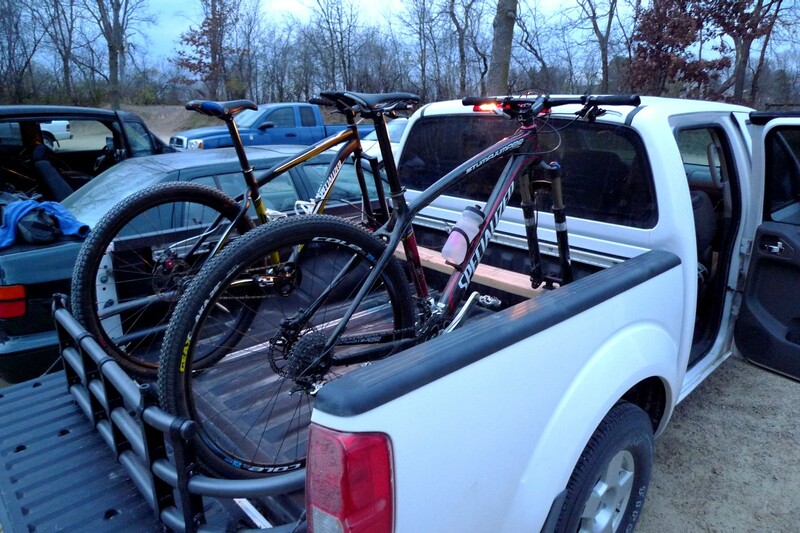 Bottom line- Go to Nebraska and don't forget your mountain bike! It's crazy good riding. Sugar Bottom Trails: Location, North Liberty, Iowa: These are some of the best trails Iowa has to offer and also some of the oldest ones. 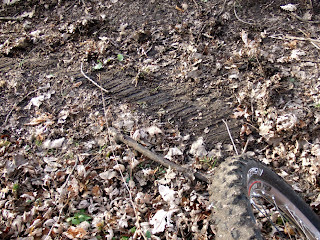 Maintained by the Army Corp of Engineers and ICORR, these trails are about 10 miles of twisty, turny, up and down stuff that is a hoot to ride. All the trails are one way, and well marked. Check the ICORR site before heading out there though since the trails will close at the slightest hint of rain. Otherwise, this is a great destination and it is an easy jaunt off the interstate. 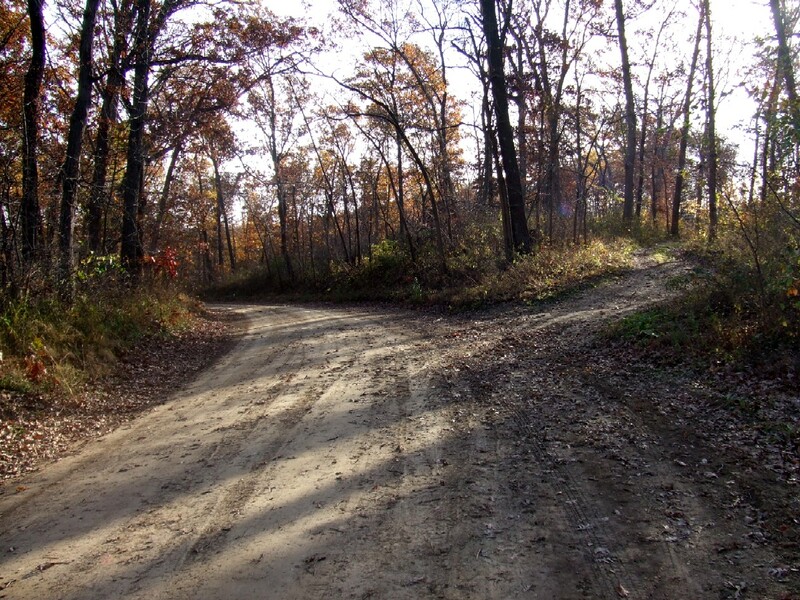 Decorah Recreational Trails: Location, Decorah, Iowa: These are some of the better trails anywhere, with a lot of tough climbs, fast, technical descents, and lots of off camber stuff. Check out the trail maps here. Notice that the town is like "right there"? Yeah, you can literally ride yourself silly on some perma-grin inducing trails, then slide on downtown for some awesome grub and libations within a half mile of dumping out of the trail system. Crazy! It doesn't get any better than this in the Mid-west. At least not from a "total experience" perspective. Add in the fact that camping opportunities are right within a short ride of the trails and it gets even better. Whelp! It's getting pretty cold out there, but there isn't any snow yet, and you can sneak in a few more rides. Layer up! Ride on! Trans Iowa V7: Psych! It Isn't About TIV7!! Well......some of it is! Too bad! It isn't like I didn't warn ya'all that this blog would be used for "detailed T.I.V7 announcements too long for the T.I.V7 site." I think ya'all will live through this. 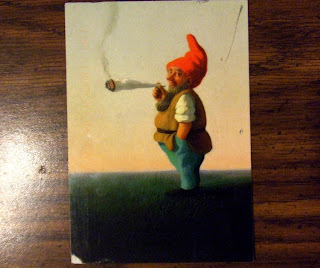 Anyway, this awesome artwork was sent to me in four post cards over a week and a half. 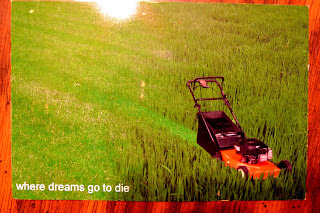 I had to assemble said post cards into what you see here. 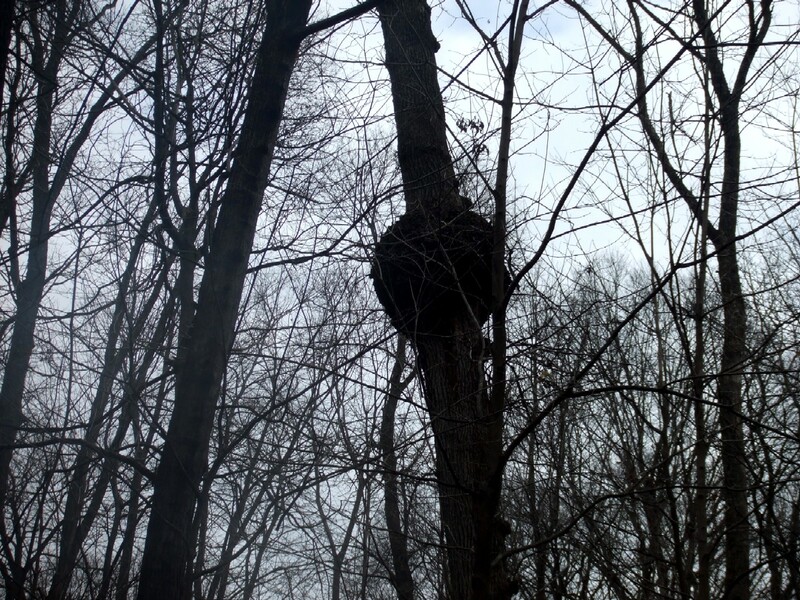 I went out for a ride at The Camp yesterday and I decided to stop and take a pic of this odd tree out there. 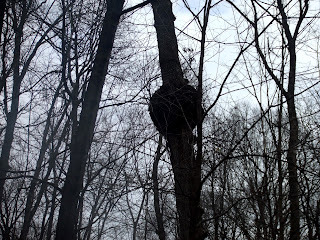 This bulbous knot goes all the way around the tree bole about 25 feet above the floor of the woods. I call it "Nature's Water Tower" because it reminds me of rural water towers found in the small villages in Iowa. I have no idea what might cause something like this, but maybe one of you readers out there has an idea for me. 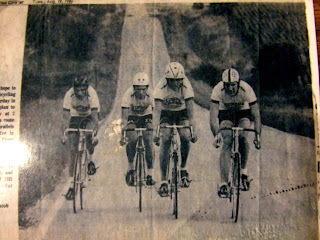 Speaking of The Camp, there will be a "Turkey Burn" ride on the Saturday after Thanksgiving on the South side of Camp. I think we're getting underway about 8am. If ya need directions, I can fix ya up if you think you might want to head out for some fun riding. 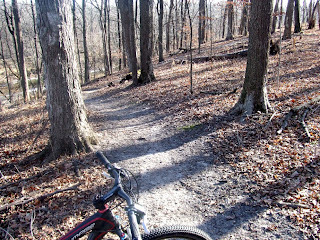 The Camp trails on the South side have been raked, and besides a few dead fall trees, everything is rideable. The recent wet weather was all soaked up by the dry ground and if we avoid any precip before the Turkey Burn, it will be bone dry and hard as a rock again soon. I think this is true to a point. Obviously, you don't want to have a wheel heavier than need be. Conversely, a wheel that is so light that it starts to "ping" around off stuff is no good either. What is the "magic" balancing point? Well, most wheels are certainly light enough, (speaking in terms of 29"er wheels here). 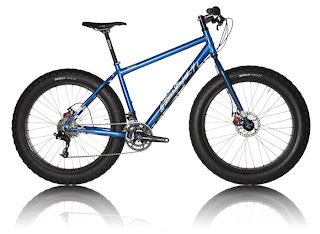 Several folks think they need sub 1600 gram wheels and for mountain biking, (read: NOT racing), that is just silly. Heck, a lot of road racing wheel sets weigh this much! I have some very light 29"er wheels, some medium weight 29"er wheels, some heavy weight ones, and some that are ridiculous. I know most of the wheels "in the middle" ride just fine. The extremes are a little more unpleasant to ride. Too much of anything is not a good thing, they say, and that goes for wheels. 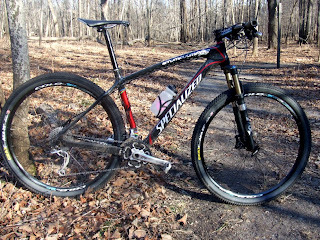 Too little mass, and the wheel gets sketchy- easier to knock off line, and doesn't track off road well. Too heavy- The wheel is harder to accelerate, feels "dead", and is actually harder to steer. And I haven't even begun to talk about flex, (which can be a very good thing), and strength, both very important functions of a wheel as well. Maybe I'll talk about this some more tomorrow. Or maybe I'll post about Trans Iowa again, just to be contrary! Ha! 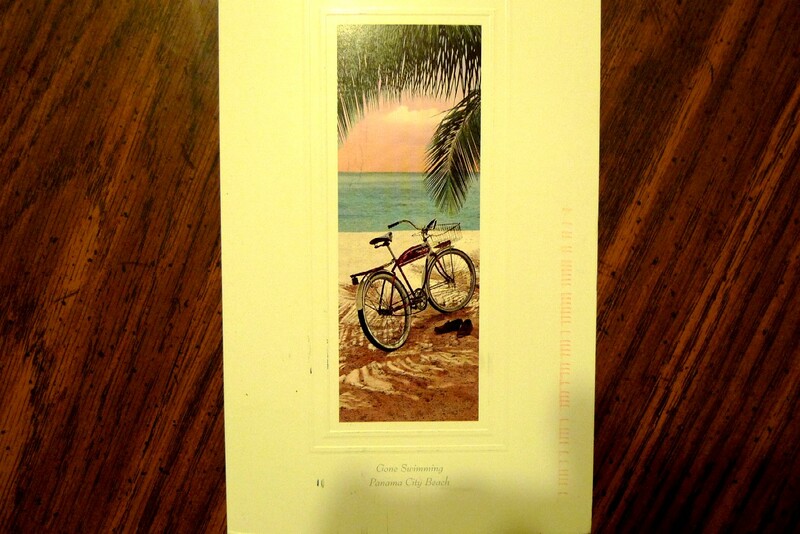 As with a previous post last week, I am going to throw in some images of post cards received from Rookies. I was seriously wondering if there would be anything worth posting, actually. Compared to the Vets and Finishers, (not to mention years past), you Rookies need to step up your game in terms of creativity! A fine bit of history unearthed here and it is much appreciated and appropriate. Registration Update: The Rookie Registration is still open. As of Tuesday, there were still 10 available spots open to claim. If we go through Saturday without filling up the roster, it will remain at whatever number we reach by then. Registration will close Saturday regardless. No more entries will be accepted past Saturday. I would be a bit surprised if we don't fill up, but the way it looks today, we may not. Either way it makes no difference to me. Once the Roster is frozen, anybody needing to drop off will need to e-mail me as soon as possible so we can keep our costs under control. This includes cue sheets, race packets, and the "Pre-Race Meat-Up". Oh......you don't know what that is? Trans Iowa Pre-Race Meat-Up: Just yesterday I received the news that Trans Iowa V7's pre-race meeting will again be held at The Grinnell Steakhouse. This is a "grill it yerself" joint where we had our meeting last year. 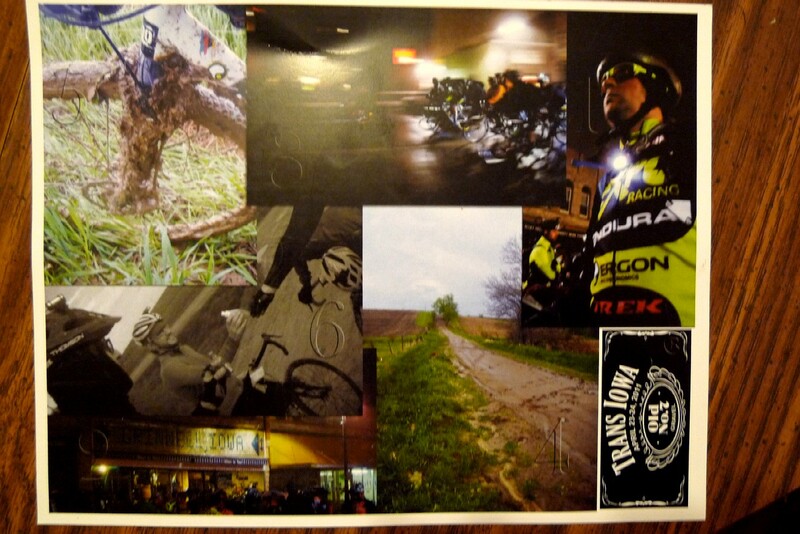 The riders liked it, the Grinnell Steakhouse liked us, and we hit on a plan to have the meeting there again. The meeting is a requirement. You must attend. At the "Meat-Up", (don't worry if you don't eat meat, we'll have something for you too. ), we'll get together, have a meal, hear from myself and d.p. on the event and what to expect, plus you will receive the all important cue sheet set, without which you can not take the start. Lodging Announcement: We have secured a block of 30 rooms at The Comfort Inn And Suites of Grinnell. (Link to site with directions) This facility is located just off I-80 and is the same motel we used last year. What's more, if you mention that you are with Trans Iowa V7, and request the special rate, the room will only cost you $64.99, the same rate we had for last year. This motel is a short walk from the Grinnell Steakhouse, and works perfectly for our needs. There are only 30 rooms available at this rate, so make your plans now. More motels are also located along the highway here, so if the Comfort Inn fills up, there are other choices near by. 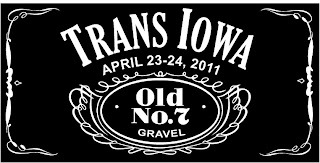 Remember- the dates for the Pre-Race Meat-Up and Trans Iowa are April 22, 23, and 24. Book rooms accordingly. We still have some details to work through regarding the finish line, checkpoints, mileages, and time cut offs. These finer details will be coming soon. We have some surprises in store, and we'll be releasing information as we can throughout the winter months regarding those things. In the meantime, figure on the first checkpoint at about 55 miles, and the last checkpoint at approximately 170miles. Figure on time cut offs being set at approximately 10 miles covered on course per hour. So, for instance, you'd have about till 9:30am to get to Checkpoint #1 using this formula. Race start is at 4am. These are approximates and subject to change, but we are expecting this to be a close estimate. More details will be released as we go through the winter. Welcome to Trans Iowa V7! Update: Seems that the decision to post detailed annoncements for Trans Iowa V7 has hit a nerve with some "anonymous" person who sent me this from "anonymous@anonymous.com" (Gotta love the ownership of this comment!) So, take this for what it is worth. Comedy? Serious? I don't put any stock in anonymous comments myself. But since this clown dared me.....here's the comment in its entirety. Please, I don't come to your blog site to read about TIV7 every single day. The separate TI blog exists for a reason. I'm thisclose to deleting my bookmark to your site (I know, don't let the door hit me on the way out). Hello, McFly? The race isn't until next frickin' April. And it's not like this is a big, professional event like Leadville or the TdF with real competitors and real prizes. It's a small-time, amateur event put on by some rustic, podunk Iowegians (bet you remember that phrase from your old blog post). I dare you to post this rant to your blog! I double dog dare you! But only if you have a well reasoned and insightful justification/rebuttal. Sorry for venting, but I feel compelled to set things right when I see something awry. 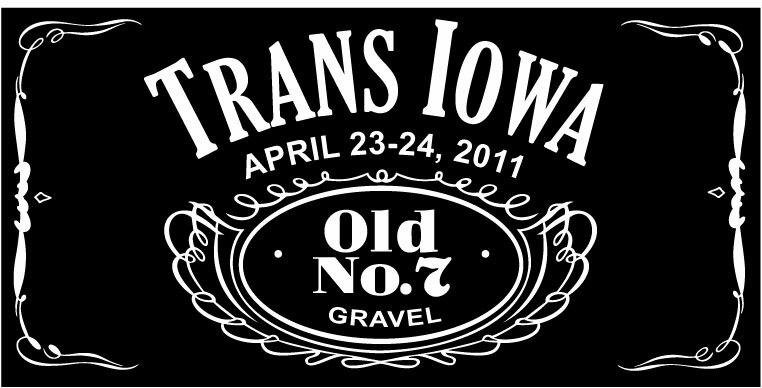 Trans Iowa V7: So What Have You Just Gotten Yourself Into? <==="Killer Bee" has an entirely different meaning in Trans Iowa. So, maybe you are one of the 50 or so rookies in Trans Iowa V7. Or...more correctly....on the roster, because in the end, ya'all won't show up. Oh, I know......there's no way you won't show up! How dare I suggest such a thing! I'll tell ya "how dare I", I've seen it six times before happen where folks with every intention of coming to toe the line do not do it. Yes- they have their reasons. Let's just say, "reality bites" and many won't come that intend on doing so today. I've got a system all set up to deal with that too, but I won't get into it now. That will come later. 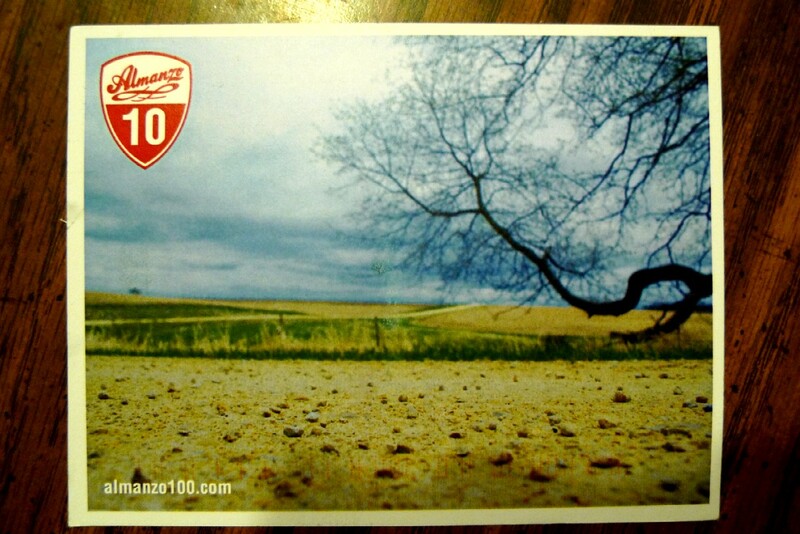 You've gotten yourself into a big, long winter of training for a triple century, plus some. You have gotten yourself into a long winter of guessing games in regards to what to wear, what to eat, what to ride, and more. You've got yourself into many long hours of thinking through your strategy, what you'll do and when. You've gotten yourself into a ride with some history in its seven short years of existence. If you haven't read about it, you can hit this site for some catching up. If you end up riding in V7, your name will be part of that story. 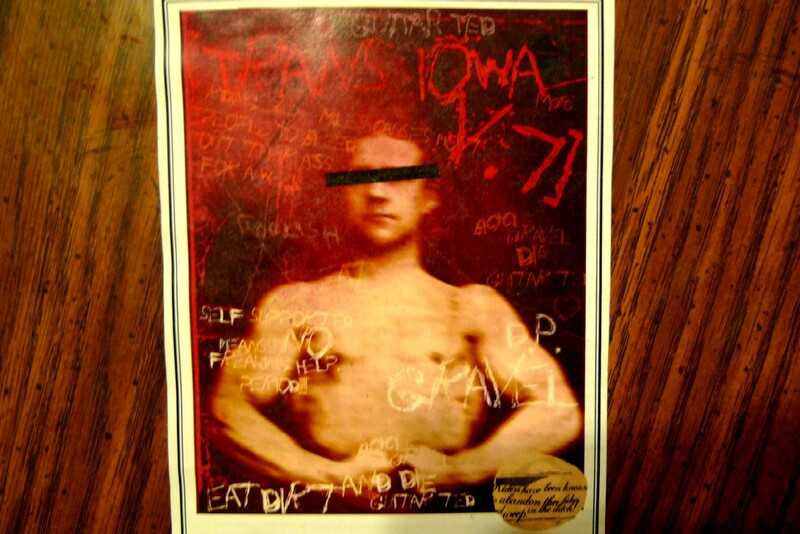 Speaking of stories- Trans Iowa V3 got a whole chapter devoted to it in this published tome by author Zach Dundas. Who knows? maybe V7 will get it's own nationally published piece. 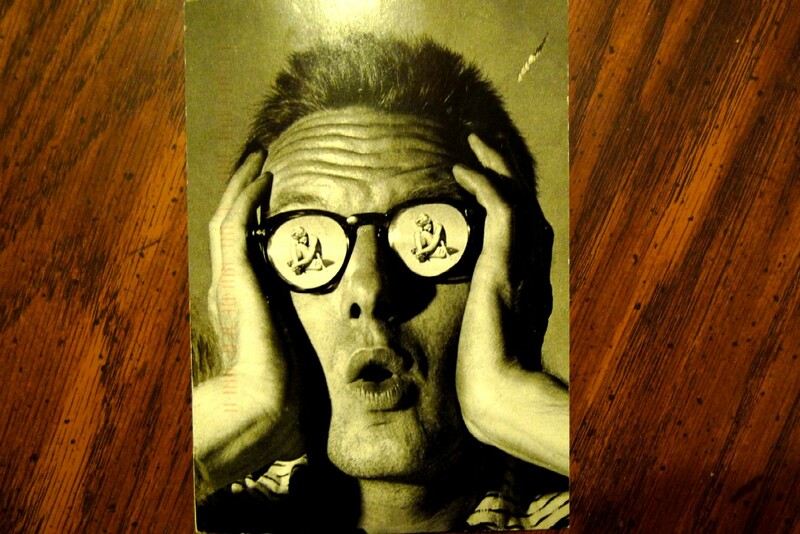 At any rate, you'll have a story to tell to the grandkids, if ya'all have any, that is. You've gotten yourself into an event where you just might make some life-long friend of some cycling freak you've never met before. You'll definitely be changed. You've gotten yourself into an event that is really tough, and not finishing it is still cool. (How weird is that?) However; not finishing it may also eat at your mind for the other 363 days of the year until you can line up to take a crack at it again. You've gotten yerself into a great big pickle. Maybe you'll show up and see just how it really is for yourself. Maybe. 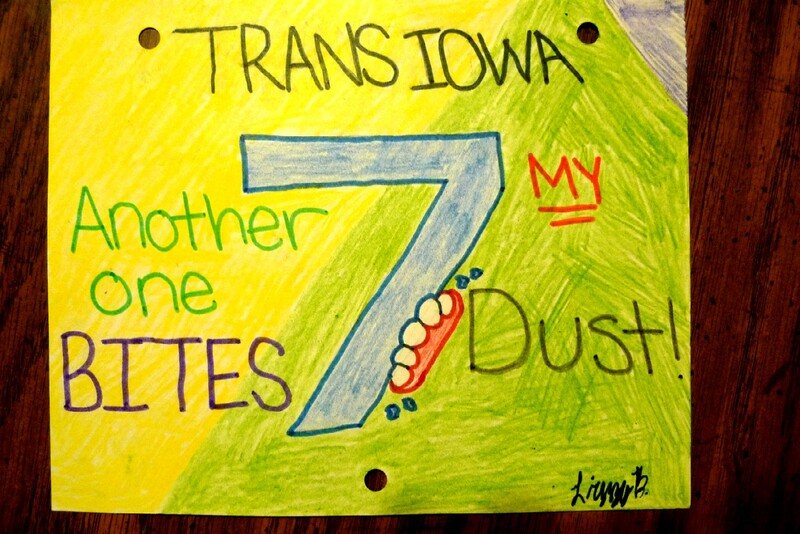 Welcome to the Trans Iowa V7 roster folks, and to those few more that make it in today. I hope you all make it to Grinnell in April next year. But I won't be holding my breath on that thought either! Just a quick update to let you all know that the Trans Iowa V7 roster has increased by 37 folks today leaving 14 spots up for grabs yet. We have added a couple to the Women's Open class and surprisingly enough, we don't have very many single speeders on board this time. Hmm..... Not sure what that might say! The Trans Iowa V7 Roster has been updated now so you can go check that out here. We'll keep registration open until all the spots have been filled. Then any left overs will go into the Waiting List. I suspect that we'll get more cards tomorrow and registration will likely fill in by then. We'll see. At any rate, this process is quickly coming to a close. Stay tuned for more updates and announcements. Saturday the trail crew was called in to action out at Camp Ingawanis. Several of us met to clear the trails of debris before winter sets in here. We raked off all the dead leaves and branches were removed. Some plans were layed for re-routes. It's going to be pretty good next spring and the crew that was there is pretty stoked. 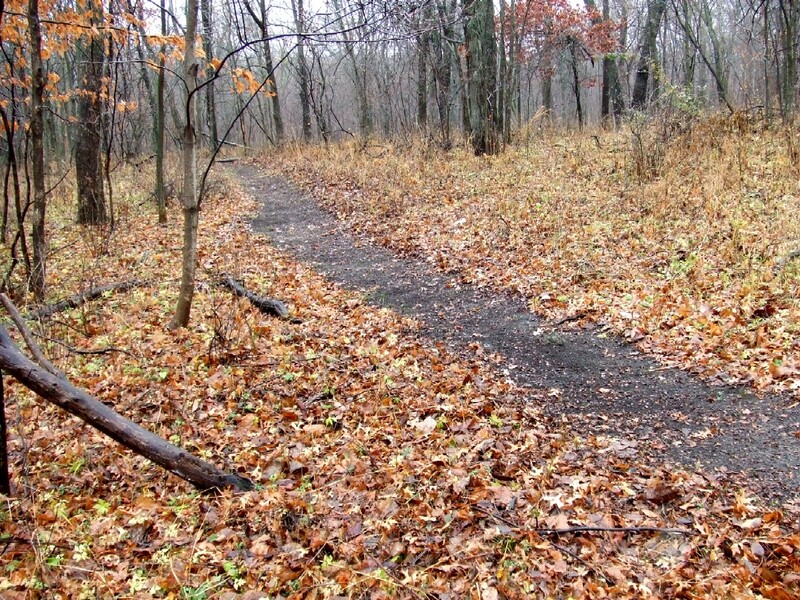 Stay tuned for updates on the trail situation next spring. Speaking of updates: Trans Iowa V7 Registration for the Rookies starts today. I'll be updating all the latest that I can during the day today on Facebook and Twiitter. A more complete update with folks on the roster so far, and any fun news, will be posted here later today and on the T.I.V7 site. Veteran Registration Closed: Well, with Saturday come and gone, this means that the Veteran roster is set. Surprisingly, we didn't fill all 40 spots available. So, the remaining 11 spots will be allotted to the Rookies bringing up the total available starting tomorrow at 9am to 51 spots. Rookie Registration: I would be quite surprised if the Rookie registration doesn't end by Tuesday. 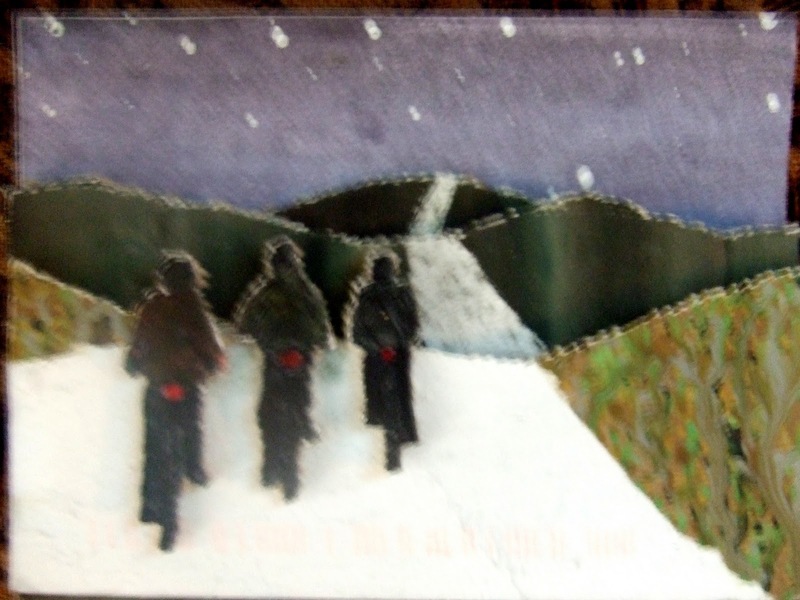 I am already aware that some folks will be waiting at the door of Europa Cycle and Ski in the morning tomorrow and I am sure that over-nighted packets will be arriving as well. It should prove to be a wild day of Registration, and I will update here on Monday late, along with timely Tweets and Facebook updates throughout the day.Oh yeah, I got an entry early, and it has been discarded. Remember: No entries were to be taken before 9am Monday, November 15th. If you thought your name should have been on the roster, and it doesn't show up. Well, I guess the rest is easy to figure out from there. Trans Iowa Tune Up Rides: d.p. and I have bounced this idea around. I also have been Tweeting back and forth with Matt Wills from Lincoln about this idea as well. 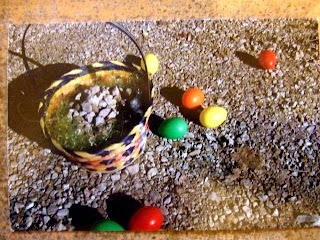 Here's the idea: A short course of gravel is set up with sample cue sheets. (Metric Century?) Everyone rides self supported. Ride to start in the dark, preferably, to simulate the start of T.I. and give folks an idea of what to expect. (4AM has been suggested) The rides would end at a suitable "watering hole" and folks interested to engage in Q&A with myself, d.p., and anyone in attendance that has T.I. finishing credentials. These rides would seek to be fun, informative, and work as a bit of training for those inclined to join us. Okay, here are the optional parts so far. d.p. had wanted to sneak something in before the winter sets in, but I am not sure time will allow for this. So, in all likelihood, these rides would take place in March or early April. There could be one, or two. Probably no more than that. There could be one in the Des Moines area, and maybe one further to the north. (Decorah?) This would accommodate folks traveling from the immediate area. Sort of a "meeting in the middle", if you will. Maybe folks would like to chime in and make a comment, or send me an e-mail (address in right margin), and I can further refine this idea if there seems to be enough interest. Okay folks, this is the last of this series on "The Belt" vs "The Chain". First though, an update on what has been going on since the last time I posted on this. I installed a Manitou Tower Expert 100mm travel suspension device on the front of the XXIX. Whew! What a relief to my paws and a major boost to the handling that was! A few more rides revealed no more issues with "The Belt". However; the belt tension is so tight that even with my "throwing" the crank arm as hard as I can backwards, the crank will barely spin one revolution. 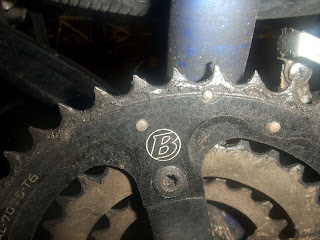 In contrast, all of my chain driven single speeds spin multiple times around at the crank when doing a similar "throw". What does this prove? Well, nothing except that there is excessive drag in the belt system which is either due to the tension of the belt resisting engaging with the cogs, or the side loading of the bearings. Probably some of both. This tells me two things. One: The tension necessary to maintain proper belt/cog interface during hard efforts also decreases efficiency of the system overall. Two: Premature wear of bearings is a distinct possibility. Now, as for "The Belt" working in a mountain bike setting, I give the system a passing grade. Yes- it works. However; one must "count the costs", both real and in a design sense, in regards to using the Gates Carbon Belt Drive. First off, let me say that Gates is working very hard to minimize the drawbacks, and someday, (perhaps), they will achieve lower costs, better design integration, and more choices in gearing options. (I speak strictly in terms of mountain biking/racing mountain bikes) However; this is now, and Gates is not there today with those goals accomplished. Belt drive fans will tell you several "advantages" over chains, but only two things they say really matter. (The rest are not really advantages over chains in single speed applications.) 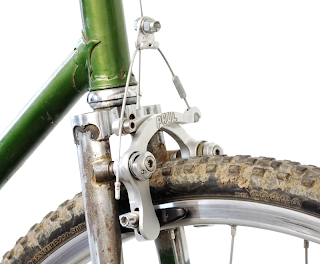 One: Belt drive set ups are lighter than chain drive. Two: Belts and cogs will outlast chains and chain rings in terms of lifespan. 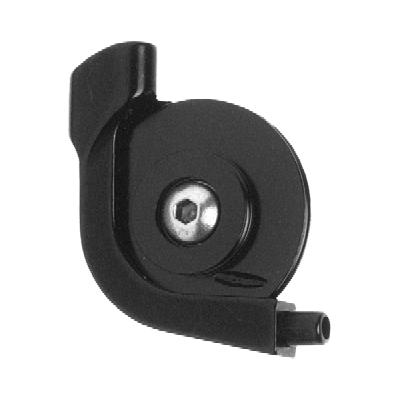 This is somewhat offset by the fact that the looming early wear issues on the bearings are still out there, the efficiency of the entire drive train suffers, and obviously, in terms of costs. Conclusions: The short and simple is this: Belts are not better than chain drive systems. Not in terms of single speed mountain biking. Belt drive has some advantages, but costs, unknown bearing wear issues, design constraints in terms of frames, and the limited availability of cogs and belts in all gearing ranges is holding belt drive back. For now "The Chain" is the obvious winner. 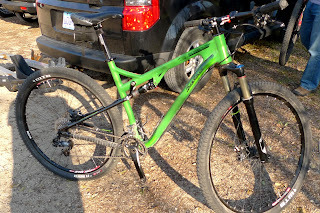 Maybe Gates will achieve the goals they have set forth for themselves and premium, high end single speed mountain bikes with belt drive will be something that makes sense. However; today that isn't the case, and most of us will be better served with a chain driven single speed mountain bike. Along the same vein as my last two updates, I am going to continue on with my discussion of "support" in the case of Trans Iowa. In this post, I am going to detail a specific type of support you should have! The first checkpoint isn't but 50 miles or so from Grinnell, as the course goes, closer as the crow flies. So, if you bail out there, it is a relatively "easy" ride back, and I would not be surprised if almost everyone that gets in could ride this loop. However; here is the deal: After Checkpoint #1, you will be getting further and further away from Grinnell, and at Checkpoint #2, you'll be as far away as you can get on the course from Grinnell as you can get, approximately 170 miles into the event. I said, "Make A Plan! ": So, if you were a smart cookie, you would have a friend, relative, or someone along, hanging out in Grinnell to bail your carcass out if you happen to hit the wall, have a bad mechanical, run out of food or water, (or both), and bonk, or whatever, and need assistance. You would have a working cell phone to call them. You would have that cell phone to call me to tell me you are out, and I could possibly give some driving directions to someone to go get you in the middle of some God forsaken Iowa country road. I would suggest you make that "bail out plan" today. You can deny all you want to that it is necessary, or the idea is not worth considering due to its "negative nature". But.......you might be reconsidering your thoughts of independance in the middle of the night, when you are cold, shivering, and can not go on. 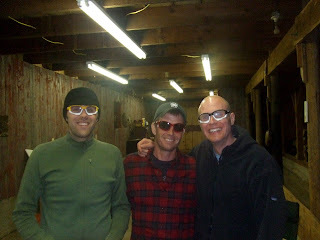 Wednesday was a planned quickie trip that Captain Bob and I took to the Twin Cities area to hook up with Jason Boucher, and Ben Witt. We were going to hit up the Murph and Leb trails for whatever we could jam in on a short afternoon, then head back home. The day started out by getting to Milltown Cycles and having a quick lunch of grilled chicken breast and scallions with Ben before we checked out to hook up with Jason at the Murphy Hanrehan trail head. Jason brought over a couple Spearfish rigs, which Captain Bob and I happily hopped on. It wasn't long before we were cruising some fast, smooth Murph trail through the woods. <====Ummm.......yeah......I have no idea what is going on with this! For whatever reason, it wasn't an "on" day for me. I couldn't go as fast as the other three out of the gate, and it took a long time for me to finally get a groove on. But I did, and the Spearfish was a lot of fun. Especially down hill. The day was one of those kind of weird feeling days where you felt rushed to pack in as much as you could get in. Less sunshine, impending weather, and time constraints didn't help matters, I am sure. maybe I was just too stressed out going in. Probably was. I know I really needed that ride! Then after Murph, we scooted over to Lebanon Hills to get Captain Bob initiated on those trails, which he had never ridden before. It was getting on in the day by this time, and the light was kind of weird. I decided to swap over to my Specialized rig I brought up for testing purposes. Rob stayed on a Spearfish. About midway into the loop, I started to get real dizzy, my head was aching, and my vision was blurring around the edges. Bonk time! I said something to the guys, and it was decided to shortcut the loop to the fast, swoopy, banked exit. We got sprinkled on here a bit. By the time we got back to the lot, dark clouds were rolling in. We all packed in our stuff and went over to Jason's house, and when we got there the skies cut loose with lightning, thunder, and very heavy rain. Maybe that headache/bonk was Divine Intervention? Maybe. Bike Shop Horrors! Shark Tooth! A local gravel grinder came in with his bike thinking all he needed was a new chain and cassette. Wrong answer. As all good mechanics know, you've got to check out those chain rings as well. Many times they also need replacing. This one was glaringly obvious. Just replacing a chain, at the proper time, can be a good way to go, but once everything wears beyond a certain point, you are going to have to replace the drive train as a whole: Chain, cassette, and chain wheel(s). This fellow obviously uses his big ring as his main drive gear, but I also replaced his middle ring, as it also showed significant wear, just not as severe as the big ring. Sure, it cost him a little more, but he wouldn't have been able to pedal one revolution with just a new chain and cassette without the chain "skipping" over that waaaaaay worn out big ring! Registration For Rookies: On November 15th, 2011 the registration for at least 40 spots on the Trans Iowa roster will open for those who have never been at a Trans Iowa before. Please read the following very carefully. If you mess this up, your entry will be disqualified. 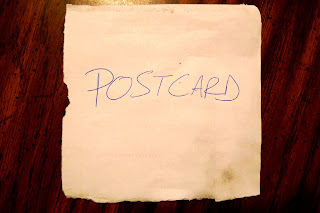 Remember: Registration is by postcard only and that postcard can be delivered by regular post, overnight express mail, hand delivered, by carrier pigeon, or magic, if you can conjure it up. I don't care by what means you deliver a postcard, just as long as you get it to me NO SOONER THAN NOVEMBER 15th @ 9am. The Following Items Must Be On The Postcard! Keep in mind that these items must be legible, and I am the final judge on what is, and what isn't legible. If I can not make the info out, I won't ask for clarification, I will throw out your entry. So you've been warned! Also, please know that your information will not be shared with anyone else. I only need this stuff in case we need to get a hold of you before the event, via e-mail, or during the event, in case of emergency. This must be a cell phone number we can reach you at the day of the event. 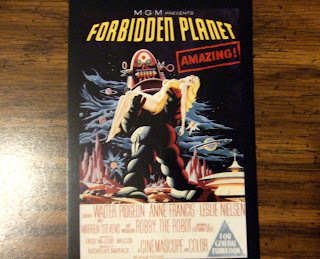 It is super important that this be readable on the card, and accurate. If I get a bogus e-mail, or it pings back, you may risk being left off the roster at some point. Remember: I only need this for communication as to pre-race details and what not. #5: Write Down "The Golden Rule" From The Trans Iowa V7 Site In Its Entirety. You can find the "Golden Rule" on the T.I.V7 site in the "Race Rules" section at the top. I need to be able to read all 44 of the words and numbers clearly. Okay......any questions? Better e-mail me ASAP from the address in the right margin here or on the T.I.V7 site. Update On Roster So Far: Of the 100 open spots so far we have 22 Veterans in and 20 Finishers in for a grand total of 42 spots out of 100 so far. Stay tuned for updates on the Veteran Registration, Roster Updates, and more on this site, the Trans Iowa V7 site, Twitter on my feed @guitarted1961, or by checking the hash tag #tiv7, or on Facebook. Update: Trans Iowa V7 opened registration for VETERANS ONLY, (ie: People who have been in the event before, NOT new folks to the event. Your chance will come next week if you are a Rookie), and today kicked off with a few overnight packages, some flowers, and some folks that drove 3 hours round trip to get their cards here. So far, by unofficial count, we have 22 Veterans on the Roster, which will be updated this evening. That leaves approximately 18 open spots for anyone that has done a Trans Iowa before to get in. I will leave registration for Veterans open until (a) we fill up the approx 18 spots, or (b) the end of the week, (Saturday), which ever comes first. If by chance there are any spots unclaimed by Veterans come Saturday, these spots will be added to the 40 left over for Rookies. There will be a Special Announcement for Rookie Registration made here tomorrow and referenced on the Trans Iowa V7 site, Facebook, and Twitter. The place where this happened was in Eagle County. A place where a certain high profile case involving a certain District Attorney named Mark Hurlbert. occurred. (Kobe Bryant case,) According to the website for the Colorado Fifth Judicial District, Mr. Hurlbert is described as being "... an experienced prosecutor, Mark knows it is important not to simply secure convictions, but to seek justice. (emphasis mine). Mark Hurlbert is not charging Martin Joel Erzinger with a felony, because "Felony convictions have some pretty serious job implications for someone in Mr. Erzinger's profession," Mr. Erzinger is an employee of Smith Barney which manages billions for rich people. So how is that for justice? 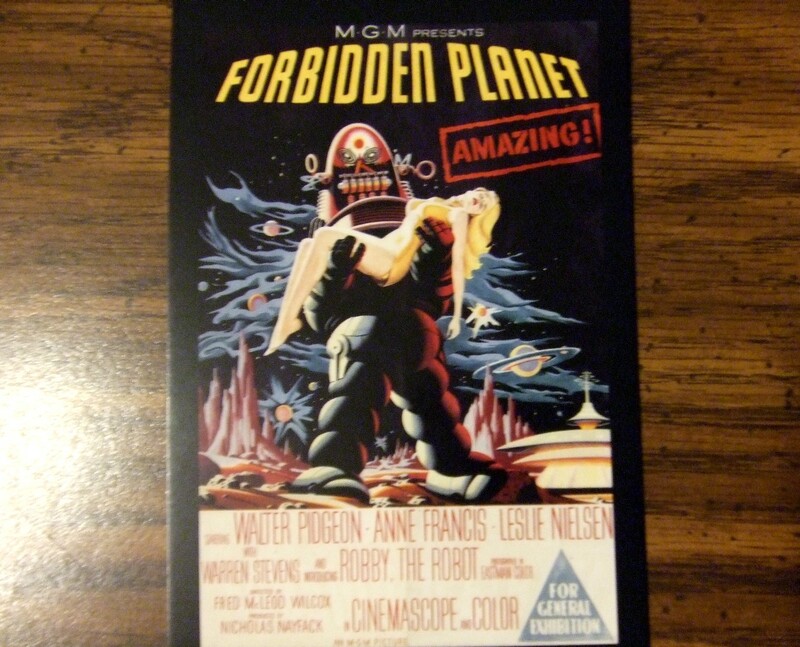 I guess you could slag this off as just an oddity, just some weird aberrant deal "out there". But think about this: High profile cases like this, (and make no mistake, this is going to be a big deal in the media and especially amongst cyclists), can be seen as precedents. They can be interpreted by non-cyclists as being a "way out" of a serious crime. That it smacks of making a life "cheaper" merely by the fact that the "life" in question is riding a bicycle should be enough to cause alarm right there though, in my opinion. If you don't see this as being injustice, then we are all in big trouble. There has been an online petition started which you can sign here. Cyclingnews.com and Bike Radar tech editor, James Huang, has started a Facebook page called "We're People on Bikes, Not Lifeless Obstacles in Your Way"
My blogging comrade, Richard Masoner, of Cyclelicious, has an idea to hit the Vail area where it might hurt them by starting a petition to take away potential business that will be generated by the Quizno's Pro Challenge bike race which is a stage race visiting Vail next August. There are several contact links on this page where you can voice an opinion to Eagle County and Vail officials. If you care about justice, protecting all lives fairly, and cyclists rights, please consider checking these links out getting involved. Thanks! 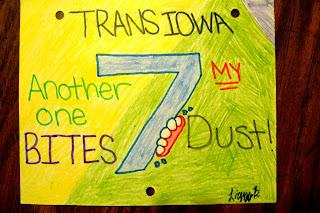 Veterans Of Trans Iowa Races Past Get There Turn To Enter In T.I.V7: Notice: This does not include ya'all who have never done a Trans Iowa before. Your turn comes in about a week on November 15th. Now I would imagine that the Postal Service has many post cards heading to 4302 University Avenue. 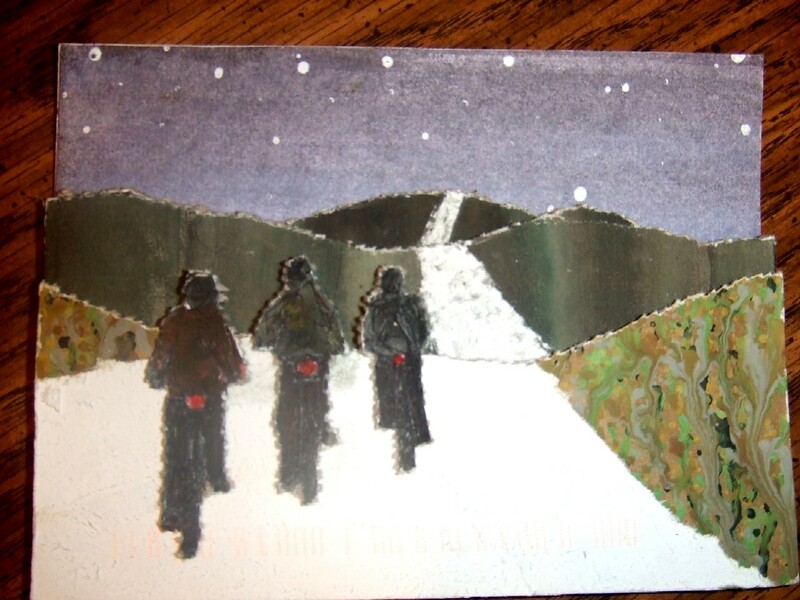 I would also imagine several cards are also on their way via overnight express, and even a few might be hand delivered. How will it all play out for the Veteran Registration? There are 40 spots up for grabs this time. Last year we had Veteran registration (which included past finishers of Trans Iowas), and we got 48 takers. Take away the Finishers from that group of 48, and I think we will have plenty of room for anyone that wants back in this go round. I figure we'll see a rush on the first day that will fill in much of the 40 open spots, if not all of them. Whatever is left over will go fairly soon after that. That's what I foresee any way. If we end up going the full week with a few left over spots, (highly unlikely, but possible), those would be added to the 40 open spots for Rookies the following Monday, November 15th. Here is how I compile the roster list. Starting at 9am CST at Europa Cycle and Ski, I will see if anyone slipped something under our door. (It's been done in the past, but be careful if you try this! We have an alarm system now that you might set off!) These cards would get on the list first. Then any walk ins would get on as they drop off cards. Next possibility is the FedEx and UPS overnight packages, which would show up before 10am. Next on the roster would be the regular post. That usually shows up around noon. By this time, I expect to see a nearly full roster. We'll see. 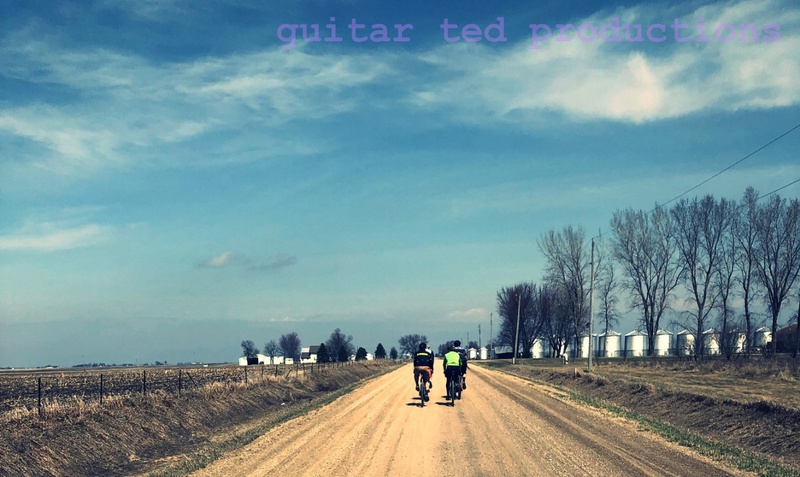 I'll post up an update on Monday Night here and on the Trans Iowa V7 site, along with updates throughout the day on my Twitter feed, (@guitarted1961), and a link on Facebook later in the day as well. 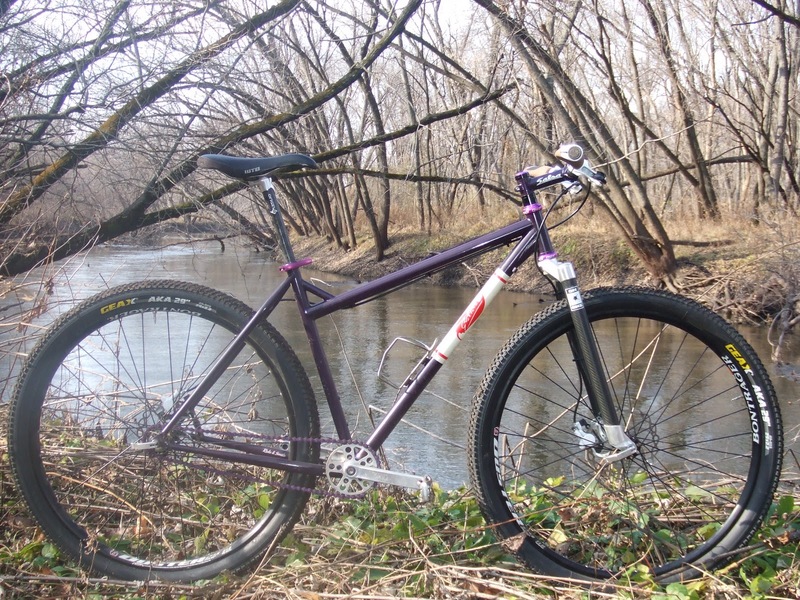 Preface: Badger Cycles was a custom bike brand run by Rob Pennell. Due to some extremely extreme circumstances, Badger Cycles went under and in the process, a lot of people got hurt. This story isn't about that. The first part of the story was posted yesterday here. After a while, I had pretty much forgotten about the Badger. That is, until another Badger came along, which was in the form of a certain limited edition single speed frame. The purchase of that bike led to a new interest in my older Badger. I started thinking about just stripping it down to a bare frame and hanging it up, and then I'd switch and think about building it up again. One thing led to another and I got busy with life which led me away from the orange Badger again. So, after another year goes by, I am out riding with a good friend who asked me out of the blue, "What ever happened to that old Badger of yours? I haven't seen much of it lately." Well, little did my good friend know, but he sparked a flame that didn't die out with that comment. 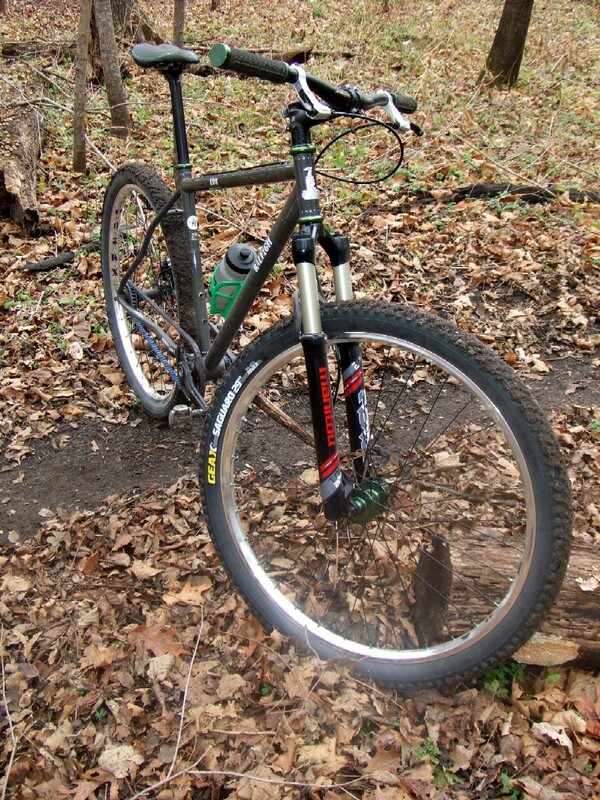 At the time, I was riding the Dos Niner converted to a drop bar set up. It was.......not what I was hoping for. Eventually, I found myself staring down at the Dos in my shop, making the fateful decision to dismantle it and retire the frame for good. As I mulled over what to do with the parts, the Badger sprung to mind. I had done some minor assembly on the bike a while back, but it was basically unrideable. Had been for....years? I don't know. A long dang time anyway. So, I figured, hey! Why not put all this stuff on the Badger? 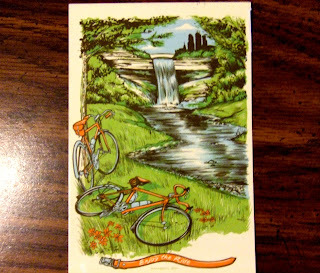 Well, I did, obviously, and I've been riding it some recently on Trans Iowa recon and around town. I found the bike is actually pretty dang good at what it was designed to do: Ride lots gravel for a lot of miles. 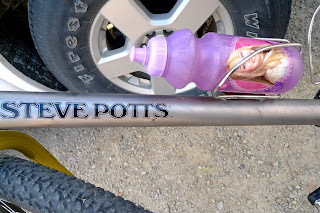 The bike was designed with long gravel road riding in mind. 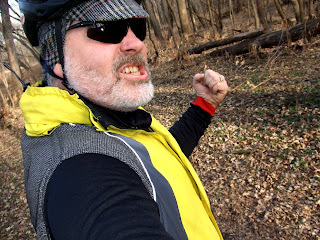 I made Rob put in the clearances for the 29"er tires, which he didn't really want to do at first, but I insisted that I had to be able to ride some single track with it as well as gravel roads. Rob and I went around a time or two with that Idea, but eventually he came to me with the design as we see it here. 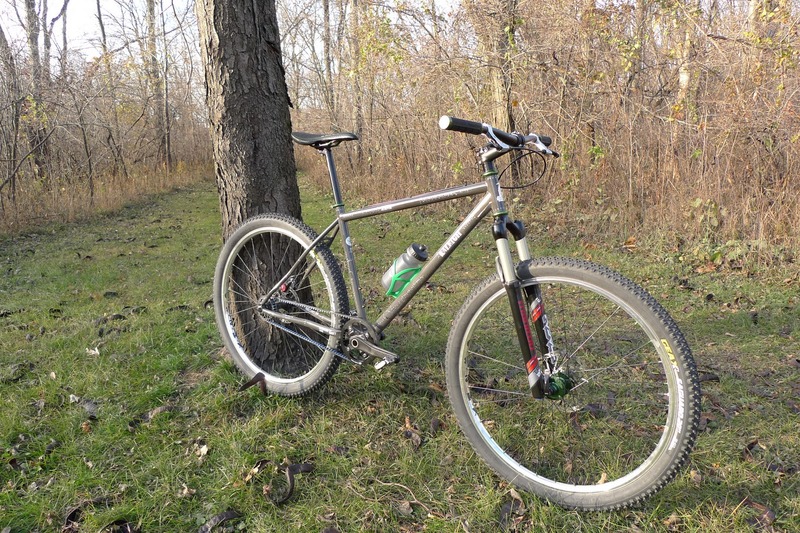 Rob went with long, 100mm suspension corrected length fork blades for a more compliant ride. At the time the bike was designed, this was odd. He also insisted that a 38mm offset was perfectly fine for a bike like this, even though at the time the move to make longer offset forks for big wheelers was well under way. This was one thing Rob wouldn't budge on, and to be perfectly honest, I was not at all happy about that. Now? I am really glad he stuck to his guns. The fork length did another thing Rob was aiming for,which was to get me out of the need for a "goofy looking stem", as he put it, and to not need a long head tube, which he thought looked weird as well. He insisted I would be able to use a "normal stem", and he was right on about that as well. The rest of the design came about from my fine tuning of my Karate Monkey. We got the seat tube size, chain stay length, and angles all from that design. The chain stay was set sort of long because at that time I felt the Karate Monkey was riding best with a chain stay setting just under 18", so that is about what Rob did here. The end of it all is that this bike, which was ahead of its time in many ways, is still a great bike and I will be upgrading some of the drive train over the course of the winter. Expect to see more of it if you are around riding gravel next year! Trans Iowa V7: Recon Complete!